Designed for high-performance overclocking, a pure aluminum heatspreader for faster heat dissipation, and an eight-layer PCB to help manage heat and provide overclocking headroom, the black 16GB Vengeance LPX DDR4 3200 MHz UDIMM Memory Kit (2 x 8GB) from Corsair can be used to upgrade the overall memory capacity of your compatible system. This memory kit features a total capacity of 16GB, which is made of up two 8GB modules. Optimized for Intel 100 series motherboards, this DDR4 RAM features a UDIMM form factor, 288 pins, a dual / quad channel configuration, a bus speed of PC4-25600, a latency of 16-18-18-36, and a voltage of 1.35V. DDR4 RAM offers higher frequencies, greater bandwidth, and lower power consumption than DDR3 modules and the XMP 2.0 built into these modules is what allows this RAM to be overclocked from its base speed of 2133 MHz up to 3200 MHz. Overclocking overhead is limited by operating temperature. The design of the Vengeance LPX heat spreader optimally pulls heat away from the ICs and into your system's cooling path, so you can push it harder. 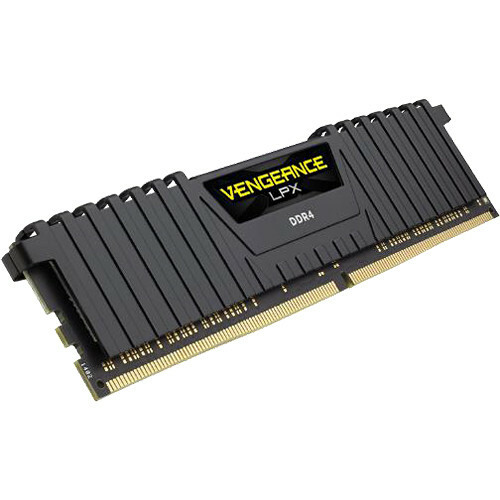 Box Dimensions (LxWxH) 6.1 x 3.6 x 0.5"
16GB Vengeance LPX DDR4 3200 MHz UDIMM Memory Kit (2 x 8GB) (Black) is rated 4.5 out of 5 by 21. Rated 5 out of 5 by Anonymous from Amazing RAM. Low Profile and great performance. This RAM has amazing clearance. I was able to remove it with the Be Quiet! Dark Rock Pro 3 Cooler installed on the ASUS X99-A II Motherboard. Although it was not installed in the first slot. OC'd to 3200MHz using the XMP Profile effortlessly. And is rock solid! Rated 5 out of 5 by Brett from Great ram This is your standard 3200 MHz DDR4 ram. It operates as expected, but be sure to check your BIOS settings to make sure it's clocked at 3200 MHz to squeeze out all the performance you can! Rated 5 out of 5 by Kaijukev from Great RAM From A Great Company! I purchased this RAM from B&H and Corsair because I know i'm getting a great product for my money. I highly recommend this item to anyone who wants speed and reliability for a great price. Rated 2 out of 5 by Anonymous from Meh Voltage for 3200 is 1.35, not the 1.2 listed in the spec. Not stable using the xmp profile, constant memory errors and crashes. Only runs if under clocked from spec. Rated 4 out of 5 by Anonymous from Very good choice Good choice and good speeds, yet the drawback is the timing. As always you have to keep an eye in the internal timing. Rated 5 out of 5 by Ethan from 8gb to 16gb More the better! this is good quality i would recommend! Main ViewIs this compatible with GigabyteGA-Z170X-Gaming 3 ATX Motherboard? Is this compatible with ASUS Prime Z270-A LGA 1151 ATX Motherboard? hello, i wonder if this is compatible con la MSI B350M Bazooka AM4 Micro-ATX Motherboard ?? Is it compatible with ASUS Z170 Deluxe motherboard?